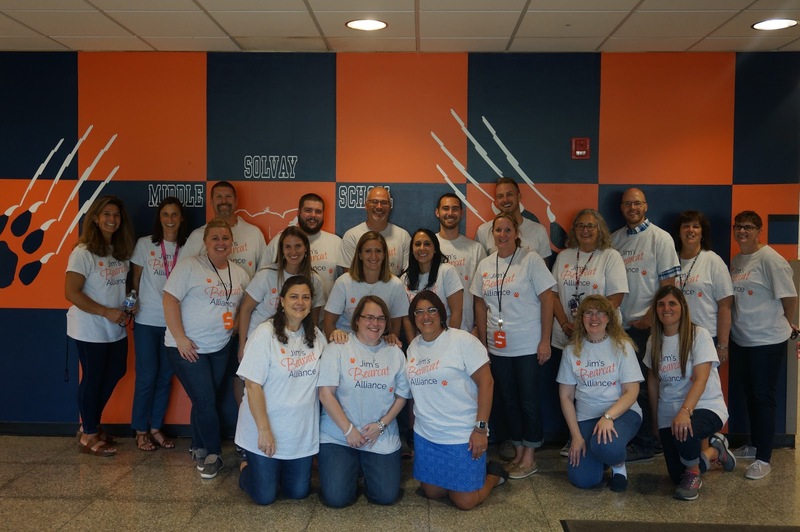 This fall, several current and retired Solvay UFSD staff members and their families participated in the Upstate New York Chapter’s annual Walk to Defeat ALS. The Bearcat staff members joined Jim’s Alliance. The team is led by Jim Altman, who is living with ALS. Jim is the husband of Cindy Altman, fifth-grade teacher at SMS. Jim’s “Bearcat” Alliance raised over $200 to donate towards Jim’s fundraising total, which was over $10,000. The money raised at these events stays in the community for The ALS Association. Each event raises funds and increases awareness to help The ALS Association fund vital cutting-edge research and patient services programs. The Bearcat team joined the Walk to Defeat ALS to raise awareness, to show the Altman’s and other families their support, and to raise funding for research and family support services until there is a cure. The funds raised are vital to programs for ALS families, such as multidisciplinary care, support groups, education and advocacy, and research into slowing the progression of ALS and finding a cure.